During the construction works the ship had a designation „Senkan 5”. She was launched on 9th November, 1919, the ceremony was held by the Japanese Minister of the Navy, Vice-Admiral Kato Tomosaburo and a member of the Imperial family, Vice-Admiral Prince Fushimi, Hiroyasu. The new battleship was assigned to the naval base in Yokosuka. At the time the test command of the vessel was given to Captain of the 1st Rank Iida Nobuteru [some sources spell it “Nobutaru”], a participant of the battle of Tsushima. Prior to this assignment he was the commander of pre-drednought battleship Shikishima. On 6th October 1920, during sea trials in the Bay of Sukumo, the ship broke world speed record for battleships, achieving the speed of 26,443 knots (48.9 km/h), and on 23th November she beat her own record setting a speed limit at 26.7 knots (49.45 km/h). After the firing test proved successful, the battleship was introduced in the Japanese Navy on 25th November 1920 and Captain Iida officially became the commander of the ship. On 1st Dec 1920 Nagato was included in the 1st Battleship Division as the flagship of Rear Admiral Sojiro. At that time, she was the first ship in the world armed with 16.1 inch (410-mm) guns. On 13th February, 1921, the ship was inspected by the heir to the throne, the Crown Prince Hirohito himself. On 1st December, 1921, Captain Iida was promoted to the rank of Rear Admiral and transferred to the General Headquarters. In the first four years, the battleship went through military training and participated in the military exercises of the Japanese fleet. On 7th September 1924 during the training Nagato’s shell sank the target-ship Satsuma. 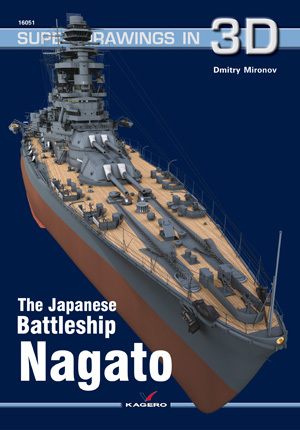 At the time when the ship entered service, the tactical-technical characteristics of the battleships type Nagato belonged to were as following: displacement: 32,720 tons (typical), 33,800 tons (normal), 38,500 tons (full load); dimensions: length of 215.8 m (maximum), 201.4 m (between perpendiculars), 213,36 m; beam of 28,96 m., draft of 9.08 m.
Armament: 8 x 406-mm/45 cal. (16 in.) guns in four two-gun turrets (range 37000-45000 m) [according to Conwey’s (6) 8 x 410 mm/45 cal. (16,1 inches)], 20 x single 140-mm/50 cal. (5,5 in. ), with a range of 17000 m and 4 x 76 mm/40 cal. anti-aircraft guns. Torpedo armament: 8 x 533 mm torpedo tubes – 4 surface and 4 underwater. Armour: main armour belt consisted of plates 102–305 mm (4–12 in.) thick, fore and aft traverse were 152 mm (6 in.) thick, the lower deck was built of 44 mm (1,7 in.) armour plates, the main deck – 51–76 mm (2-3 inches). Nagato’s turret barbettes had armour 76-305 mm (3–12 in.) thick, and the conning turret 97-356-371 mm (3,8–14–14,6 in.). The crew consisted of 1,333 men. The armour protection consisted, among others, of longitudinal and transverse bulkheads that were placed in the hull from the first to the fourth turret. The main deck consisted of three rows of vertical slabs and it was an important element of the longitudinal strength of the ship. Armoured side belt, of 2.8 m height, was made of 305 mm plates (VC grade steel – Vickers Cemmented), and it started from the turret barbette No.1 (46 FR.) and ended at barbett turret No. 4 (270 SHP). Constructive underwater protection consisted of fuel tanks 3,125 mm wide, and additional tank width 3,049 mm, which can be used as fuel tanks and longitudinal armoured bulkheads. The hull was divided inside into five decks. The average height of the deck was only 2 meters. Hull was fully riveted (each took more than 3 732 000 rivets!). The battleship was propelled by 4 turbines, each working on a separate shaft, located in a separate engine room, in a watertight compartment. The turbines were designed by Japanese designers, who worked in the Naval Technical Department in years 1916–1917. Turbine models received the designation “Tikhon”. Each main turbine consisted of high and low pressure turbines as well as of gear, transmitting its rotation to the shaft. An interesting feature almost unparalleled at the time, was the lack of the cruising turbine. Every turbine powered a three-bladed propeller, 4300 mm in dia-meter. Turbines for Nagato were produced at Kure Naval Arsenal, for Mutsu – in Yokosuka Naval Arsenal. The total area of the boiler rooms amounted 638 m2. 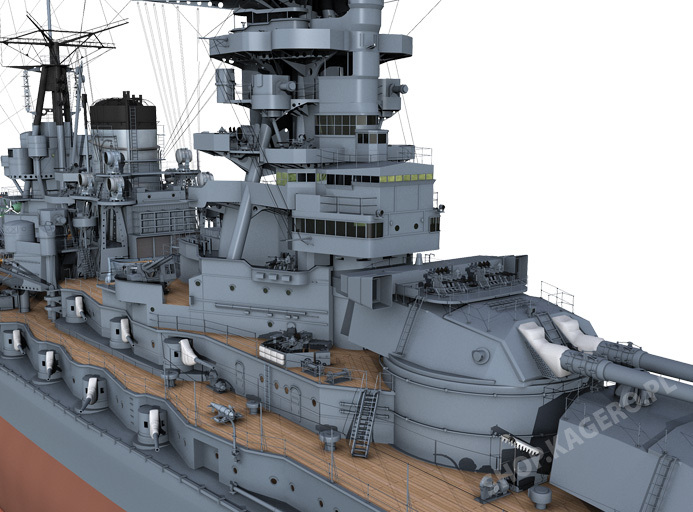 Battleship class that Nagato belonged to had 2 boiler rooms. In the bow there were 6 small mixed heating boilers “Canon”, aft – 15 large ones of the same system. The boiler rooms were divided by longitudinal bulkhead into two parts. The first boiler system – Canon – was designed by Marine Technical Department in 1902–1903. And during the development it was based on the basic design of the English steel boiler system “Yarrow”. In 1924–1925, major changes were made in the project in order to improve boilers’ steam ability. Mechanisms: design capacity of 80,000 HP, 4 turbine system Gihon, 21 boiler system Canon (5 coal and 16 oil), 4 shafts, 4 propellers, 2 wheels. Fuel capacity amounted to 1600 tons of coal, 3400 tons of fuel oil. The maximum speed equalled 26.5 knots, and the cruising range covered 5,500 miles at speed of 16 knots.